CHEROKEE DOUBLE WALL KIT with #2 round reed and #2 smoked reed. 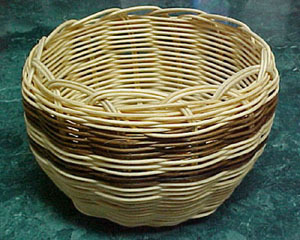 This wonderful basket kit is one of our most popular designs: easy, fun and woven in two shades of reed. Measures approximately 6" wide and 4" tall. Our easy to understand instructions and very detailed pattern make this is an excellent size for learning this technique.